Fantastic!, you found us! - we've been working hard to try and ensure we have the parts you need! FINDING YOUR MISSING OR LOST LEGO PARTS STARTS HERE! 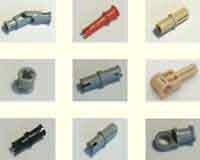 and bulk parts and have been supplying spares worldwide for more than 13 years. No sign-in or passwords required...simply browse and search our comprehensive inventory of Lego, choose the ones you need and securely checkout via. PayPal using the payment method of your choice. 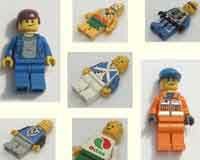 Click on image to browse our Series and olympics minifigures page. 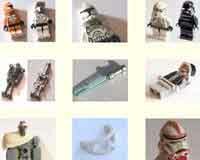 Hundreds of new, vintage and hard to find minifigures - Listed on several pages sorted by torso colour - click image to search the first page - remember to click on the 'next page' link at the bottom of each page to view the full range available. With over 200 pages of different Lego parts, our customers tell us our site is refreshingly easy to navigate and contains the most comprehensive range of parts from a single supplier - we hope you too find all the parts you need. To get started in your search, choose a category from the menu tabs on the left. 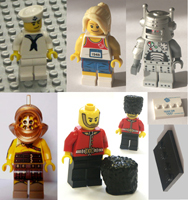 New and older versions of Lego parts often vary by design and colour, so if you are replacing parts on an older set, new parts may look out of place - email us after checkout with the set numbers you have bought your parts for and we will make sure we dispatch the correct/genuine variants you need. We always go the extra mile where we can as we value customer satisfaction and the positive feedback we get. Whether you are here to buy parts or not, we hope you enjoy looking through our interesting and varied inventory of parts. If you encounter any difficulties or have a query, feel free to email us at info@spareblocks.com If you would prefer to search the site using key words a search bar that will search the entire site is located at the top of page B. Trading for + 10 years, Spareblocks.com is a professional service and all parts are warrantied with a 14 day money back guarantee. 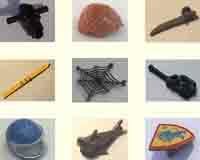 Spareblocks.com is a trading name of the company OGH (Oddy, Goss & Hunter) established 2005.